Steven Stull is in demand as a classical performer and crossover artist with symphonies across the United States. A frequent performer with Ithaca's Cayuga Chamber Orchestra he has also been heard with orchestras in Buffalo, Rochester, Anchorage, Jacksonville, Norwalk and has over forty performances with the Syracuse Symphony Orchestra. He marked his fiftieth performance with West Virginia Symphony Orchestra in November of 2012. He has appeared with Glimmerglass Opera, Tri-Cities Opera, Syracuse Opera, Artpark, Brooklyn Academy of Music, Kyrgyz State Opera, Opera Theatre of Pittsburgh, and Oswego Opera. Steven can be heard as the Wolf on the CCO's recording Boyz in the Wood. His other recordings include: West Virginia Symphony Orchestra's "Home for the Holidays" and "Tales from the West Virginia Hills"; "The Pulse of an Irishman"; and "Opera Cowpokes". His video production Opera Cowpokes Alive! was seen on public television. 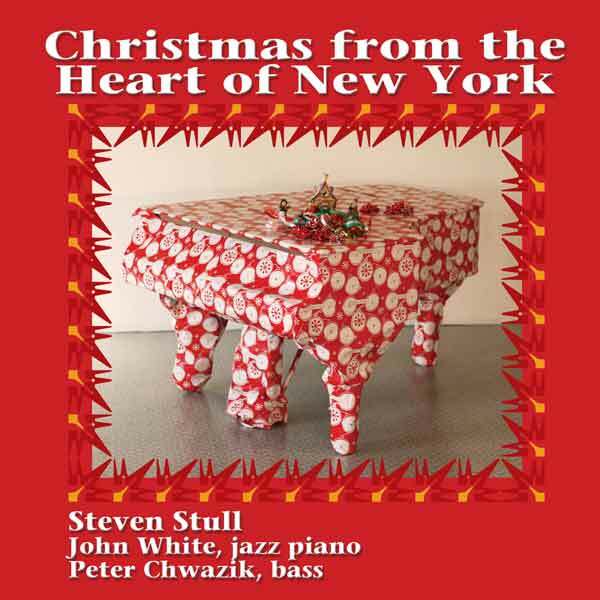 His latest CD, "Christmas from the Heart of New York" features favorite Christmas carols with jazz pianist John White and bassist Peter Chwazik. In 1990 Steven co-founded the CRS Barn Studio with choreographer Jeanne Goddard. Together they present an eclectic series of music and dance performances on the CRS Growers organic vegetable farm overlooking Cayuga Lake. A graduate of the Eastman School of Music and Oberlin College Conservatory, Steven is also a narrator, producer, director, composer, painter and photographer. Multi-instrumentalist and composer Peter Chwazik has been active in the performing arts in upstate New York for more than 25 years. As a composer, Peter has been commissioned to score modern dance pieces for Lois Welk and American Dance Asylum, Jill Becker, and Jeanne Goddard and CRS Barn. He also has composed improvised scores for David Dorfman Dance and Mark Taylor Dance Alloy. As a performer, in addition to producing work by the Peter Chwazik Trio, he has had concert appearances throughout Europe, Canada and the U.S. with a wide variety of artists including vocalist Rhiannon, free jazz trumpeter Don Cherry, and a number of combos and big bands. Through the 1990s he toured and recorded with cellist Hank Roberts, documented on the discs “I’ll Always Remember” and “Saturday/Sunday” (LevelGreen). He recorded and toured the U.S. with former Phish guitarist Trey Anastasio, appearing on his album “Shine” (Sony, 2005). His work with the Nana Simopoulos Group can be heard on “The Best of the 1989 Montreaux Jazz Festival, Part II” (BMG, 1990). Since 2006, he has been a principal member of Alligator Mouth Improv, and has collaborated on a number of projects with Steve Stull including the Opera Cowpokes recordings - as well as many live performances together throughout the Finger Lakes region. Humphries and regularly plays with the bands Back Talk and the NEO Project. One highlight of his experience includes ongoing duo and small group collaborations with jazz vocalist and free improviser Rhiannon. John's album with Jeanne Goddard - "Music for Modern Dance, Vol. 1" is available on the CRS Barn Studio label. Music Director and Organist for St. Paul's United Methodist Church in Ithaca, NY.